Mooloolah River, Sunshine Coast, Queensland, Australia. Quite a good number of sea slugs on this website are undescribed - at least 20%. At some point when their academic duties permit, or it complements a bigger scheme to do so, or they have a point to prove, and they have specimens at hand to examine, and available funds (everybody has to eat) taxonomists will eventually describe them. Phyllodesmium undulatum has appeared on the Slug Site twice before, as Phyllodesmium sp. - BOW 257 in Feb 2001 and Phyllodesmium sp. - BOW 375 in July 2003 so it is not an exciting new find but now it has a name. Having a name is a great step forward because it provides an official place in the taxonomic hierarchy indicating its relationship to every other living thing plus we all know what someone is referring to when they say or write Phyllodesmium undulatum. We can communicate unambiguously about it. Phyllodesmium undulatum has a transparent body allowing the internal organs to show through. There is a thin white medial line running longitudinally the full length of the animal’s dorsum. Some specimens present with an additional white line laterally on both sides of the dorsum that extends from the base of the oral tentacle to each successive ceratal cluster, surrounding the base of each and at times even reaching across to the opposite cluster when they are closely situated. The mostly transparent cerata are cylindrical and each contains a highly visible, exceptionally undulating, but unbranched extension of the digestive duct - hence the name undulatum. Sub-apically the cerata bear a light blue/purple colour with the yellow tips being tapered and curled and carrying non-functional cnidosacs. The rhinophores and oral tentacles are long, tapered to a point and smooth with yellow extremities sometimes with blue colouration evident towards the base. The narrow foot has anterior corners that are moderately tentacular with yellow edging anteriorly. 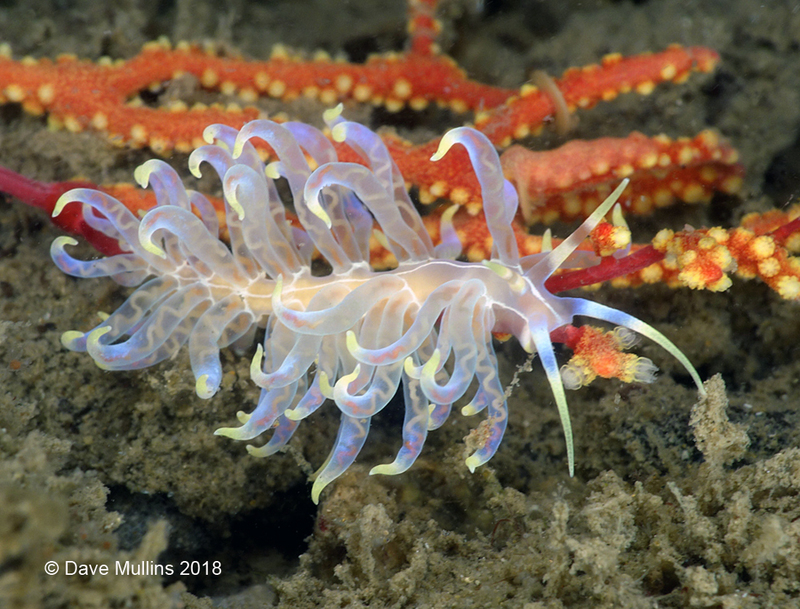 Generally speaking the Phyllodesmium are known for their well-developed cerata that often mimic the polyps of their very specific octocoral food source making them cryptic in situ. The cnidosacs of many aeolids, that contain nematocysts (stinging cells) sequestered from their prey, are either lacking or non-functional in the Phyllodesmium. While most species of Phyllodesmium are called solar-powered slugs, because they host symbiotic zooxanthellae in their tissues, mainly in the cerata, Phyllodesmium undulatum is one of only a few that do not do so. This species is considered the most primitive or basal of those thus far described in the Phyllodesmium due to the cylindrical cerata, unbranched ceratal digestive ducts, lack of symbiotic zooxanthellae in its cerata or tissues and the retention of cnidosacs (though non-functional). With very few exceptions the Phyllodesmium are only known from the tropical regions of the Indo-Pacific (apart from overlaps). No one was more surprised than me when this species turned up in the Mooloolah River, southern Queensland, Australia. Then again maybe I shouldn’t be, considering all the other exotic finds that favour this waterway. 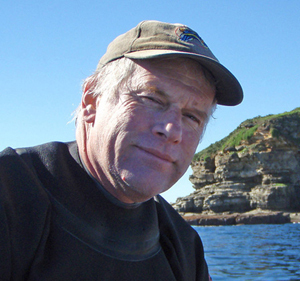 WEBMASTER'S NOTES: Dave has been active in underwater photography since the early 70's and is presently the Webmaster/Publisher of Insights , a web site you definitely should put on your list of sites to visit! An exciting event is coming September 2-5, 2018! 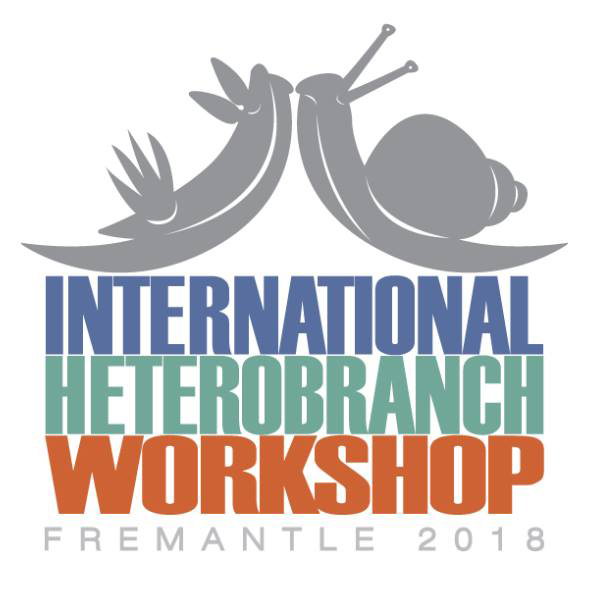 The International Heterobranch Workshop held at Fremantle, West Australia. Nudibranch reference material comes in many shapes and sizes but primarily books and websites. The problem with reference books is outdated material and their weight when travelling. Taxonomy is changing and adding or altering names at a rapid rate. The problem with the Internet is range and accessibility. Now, thanks to the development by and ongoing efforts of Gary Cobb there is a series of smart device applications called Nudibranch ID. You'll be able to reference nudibranchs from around the world. No web connection required and fully searchable. These field guides will place right at your fingertips, anytime and anywhere, an outstanding selection of Nudibranchs found throughout the World. Available as Apple or Android versions. These are true Apps not just simple identification guides. Search functions and the ability to create lists for emailing are game breakers in this field. They are updated (for free) regularly. Visit: www.inudibranch.com for a full description.